W E “Willie” Jones was born in Carmarthen in October 1916. The diminutive (5′ 5″ or 165cm) Jones played fly half for Neath from 1937-1940. He was a Welsh trialist and wartime International and after the war, following service in the RAF, played for Gloucester and Gloucestershire from 1945-1949. His kicking feats for Gloucester in the 1946-47 and 1947-48 seasons are said to be one of the reasons why the dropped goal was reduced in value from 4 to 3 points in 1948-49. He was also a noted cricketer for Glamorgan from 1938-1958. Before WW2, Willie Jones played cricket occasionally for Glamorgan as an amateur, but it was as a Rugby player with the Neath club that he made his mark. After playing in the first Welsh trial in 1938-39, he was promoted to the senior side for the second in which The Times named him “outstanding player of the match.” However The Possibles beat The Probables 21-6 in the final trial and he missed out on selection that season. After the outbreak of war, he played regularly for Neath in the fragmented 1939-40 season and played in the first wartime International against England at Cardiff on March 9, 1940. Corporal W E Jones (RAF) was also one of three travelling reserves for Wales against England at Swansea on November 23, 1944, but by the time the Five Nations Championship resumed after the war, his chance of a full International cap had gone. Willie played again for Neath against the touring New Zealand Army team on November 3, 1945 but at the start of the 1946-47 season he joined Gloucester, having been stationed near Gloucester with the RAF. He played regularly for Gloucester and Gloucestershire that season and in the County Championship semi-final against Middlesex at Kingsholm on March 1, 1947 he kicked 18 points in a 24-17 victory. In the final against Lancashire at Blundellsands two weeks later he dropped two goals (which were then worth 4 points each) in an 8-all draw to force a replay at Kingsholm which Gloucestershire narrowly lost. 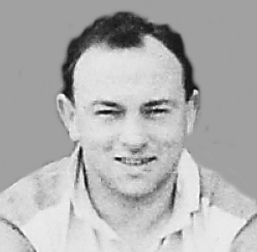 After only 22 games Willie Jones broke Tom Millington’s Gloucester club record of 154 points in a season, which had stood for 25 years; he scored a further 35 points in 3 games for Gloucestershire. He kicked an amazing record 17 dropped goals. All this in one of the worst winters on record and with the old leather ball. In 1947-48 Jones again kicked Gloucestershire to the semi-final of the County Championship where they lost to Eastern Counties at Bristol. He kicked 214 points in all matches that season. In the 1948 cricket season that followed, Glamorgan won the County Championship for the first time and Willie Jones led the way scoring 1656 runs and taking 49 wickets. In two weeks that June he hit two double centuries. Wilf Wooller, the Glamorgan captain, had dropped goals for both Wales and Cardiff from inside his own half and there was banter in the dressing room as to who could kick the longest. One evening after play on the cricket pitch at Cardiff Arms Park, the pair decided to settle the argument once and for all by marching out onto the adjoining Rugby pitch with a pair of Rugby balls. As Wilf remembered “Willie was a born competitor and hated losing, especially to me, so if I outkicked him, I knew that Willie would carry on the challenge until dusk, or even continue it the next evening!” There is no record of who won! On 5 February 1949, Willie Jones announced that, after playing only six games for Gloucester and one for Gloucestershire (against Devon), he would not play again that season due to a knee injury sustained in November. Despite this, he turned out for Gloucester three weeks later as a replacement for Burrows whose wife was in hospital. He had a Test trial in the 1949 cricket season but, just when it looked as if he might win a Test cap, he injured his knee again fielding at Old Trafford and was forced to miss the rest of the season. This injury, which turned out to be a broken kneecap, finally ended his Rugby career. Willie Jones had been a controversial figure throughout his Rugby career. Variously described as “outstanding”, “a wizard” and “a kicking genius” by The Times, he was also described by the same newspaper as having “scant sense of an opening or constructive play”. The Gloucester fans were also divided, but all agree that his remarkable kicking will always be remembered. After retiring from county cricket in 1958, having scored 13,270 runs and taken 189 wickets, he became cricket coach at Dean Close School, Cheltenham. He died at his home in Gloucester on July 25, 1996. I played and captained the Dean Close Junior School rugby 1st XV and the senior school’s Yearlings with Willie helping us out. He would look at me and say: “Let’s run it Lim”. And we did. Both teams were unbeaten, largely, for me, because Willie inspired free flowing rugby. I will always remember his distance raking punts, massive drop kicks and spiraling reverse passes! My greatest rugby inspiration. Thank you Willie! I was so pleased to read this page. I never saw Willie play rugby though I recall Brian “Bomber” Wells telling me what a terrific player he was. My personal memories of him are confined to watching him play for the Glamorgan cricket team. I saw him make a number of big scores, going in at number 4. I remember well his lightning running between wickets and one hilarious partnership with wicket-keeper Haydn Davies whom he overtook coming back for a second run. Above all though I remember his glorious fielding in the deep where with his speed he turned many, many potential boundaries into singles. A word about Willie’s place kicking. I saw him playing for Gloucester against Newport at Rodney Parade. A heel in the mud, a quick placing of the leather ball, couple of steps, and bang. It was all over in about five seconds. What power and timing for such a little man.